I couldn't remember the name of this block for the life of me. The entire time I was working on it I called it a goose star because it has flying geese. Then while cruising some blogs, I found someone else making it -- Sawtooth Star, that was it. The companion angle ruler goes nicely with the easy angle ruler and will make the middle part of the goose unit. 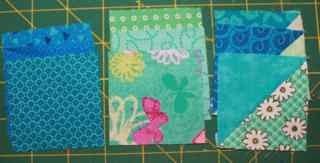 Using two inch strips of background fabric, cut 4 goose middles. 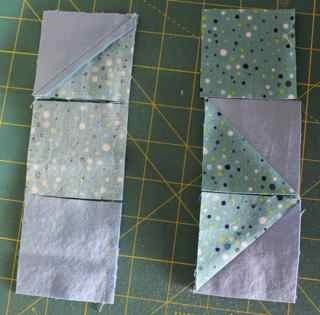 While you have the light purple strip out, also cut 4 squares of fabric for the corners of the block. Here is the ever hand Easy Angle ruler which makes the wings of the goose. 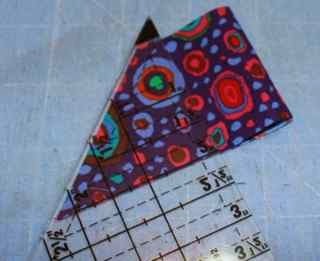 Also from 2 inch strips use this ruler to cut 2 pairs of triangles. 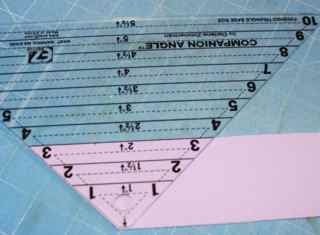 If you are not a ruler person, you can also cut rectangles 3.5 by 2 inches for the goose and use 2 inch squares for the wings. 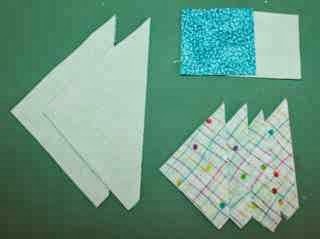 Draw a diagonal line on the square and use a "sew and flip" triangle to make your wing. 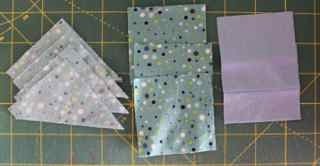 There is a nice tutorial here that goes through some of the MANY options for making flying geese. The key is that your goose should be 2 inches by 2.5 inches unfinished. 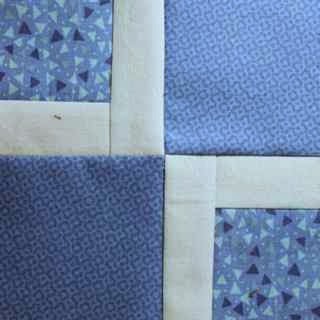 In addition to the triangles for the goose blocks, you will also need four 2 two inch squares of background fabric and one (huge) 3.5 inch square of the darker fabric. 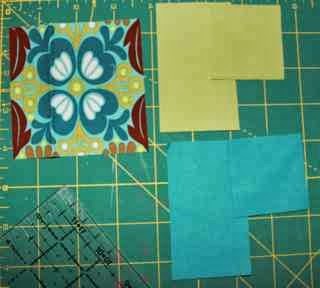 If you don't have a 3.5 inch square, you may also piece the center from four two inch squares of fabric. Match the wings to one side of the middle pieces matching up the pointy ends. 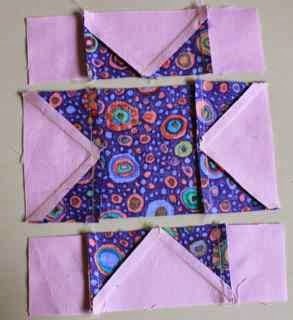 Sew on all four right wings. After sewing on the right side, finger press and line up the left side the same way. Sew on all four left wings. Press your geese units and remove the dog ears. 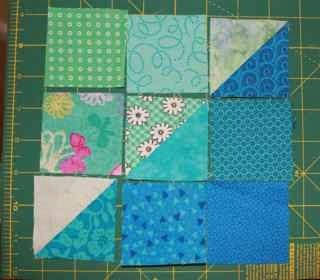 I like to assemble the rows individually on this block rather than webbing it as I would a regular nine patch. See the little seam where the scissors are pointing? If you can get your seam to line up here, you will get nice sharp points. 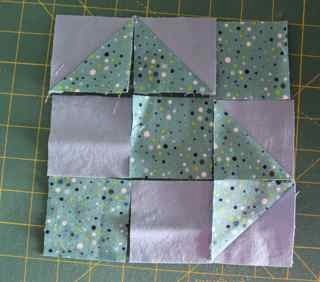 Sew one goose unit onto each side of the center square. Make sure the wings are lined up with the wide base toward the dark center of the block. 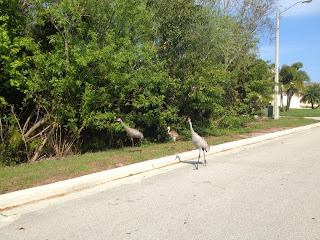 While you are at the machine, also sew one light colored background square onto each end of the other two geese units. Press the center portion toward the middle and the top and bottom sections away from the center. This will allow the points of the geese to lie flat. Sew the three rows together and press nicely. Check your finished block to make sure it is 6.5 inches unfinished. Add to your ever growing block collection and enjoy! 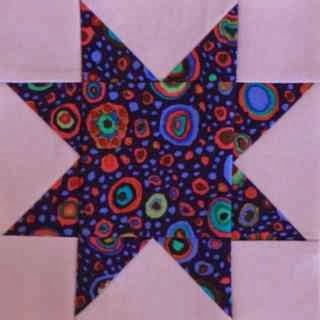 Stars are one of my favorite motifs for quilt blocks. There are so many different kinds. 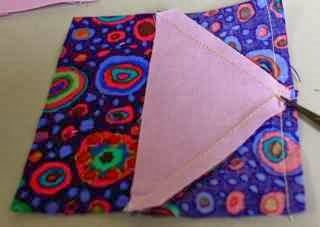 This one uses flip and sew triangles. 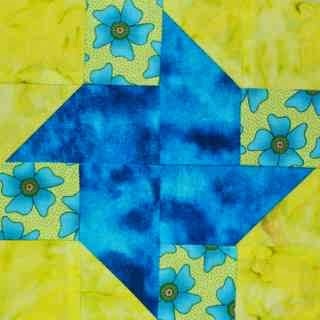 Place one square of background fabric on the top of each teal rectangle and draw a line from corner to corner on the background square. 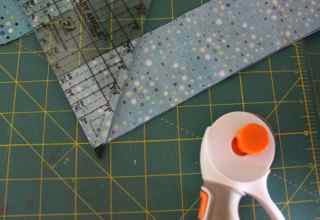 Sew on the line and then flip, press and trim away the extra fabric behind the seam. Next sew the last 4 squares of background fabric to the 4 squares of accent fabric. Press away from the background fabric. 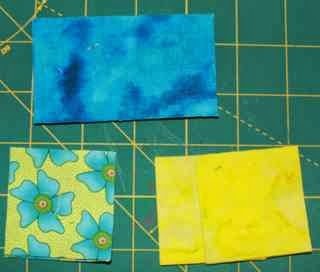 Match each flip and sew rectangle to the two patch making sure the background fabrics touch one another. Sew an press away from the dark fabric. Arrange the four subunits as shown so that the star points rotate. Sew as you would a four patch. There you go -- another quick and easy block. 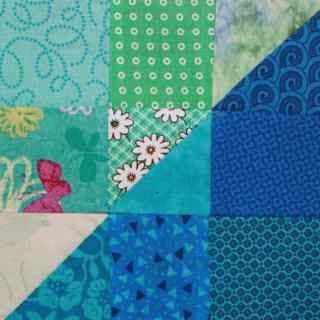 This one is super scrappy and an excellent way to use up those extra half square triangle blocks that keep showing up. It is on a nine patch grid (of course) and so will use 2.5 inch (unfinished) subunits. 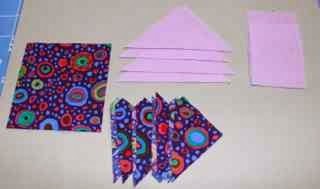 3 - 2.5 inch squares of assorted light fabric. 3 - 2.5 inch HST units cut from a light and a dark fabric placed right sides together. 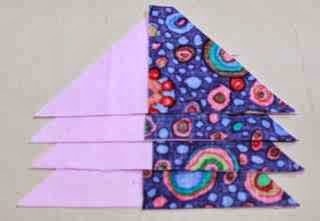 Sew the HST units along the long side of the triangle and press toward the dark fabric. You will now have nine 2.5 inch squares all together. Line the HST units up along the center diagonal with the dark sides all facing toward the bottom and right of the block. Fill the light squares in along the top and the dark on the bottom. I had a kind of wild print that I got as part of a scrap exchange many moons ago. I was looking for something that would leave it whole when I stumbled across a post from Cathy's Sewing room while trying to catch up on e-mail from vacation. She didn't give the block a name, but measurements were pretty easy to figure out by thinking about a 4 by 4 grid. The large center square is 3.5 inches. I chose to fussy cut mine, keeping in mind that the center point of the square is 1.75 inches. 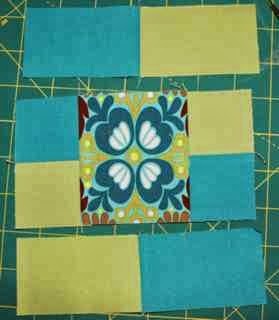 I chose to use a lime green for the light, again keeping in mind that some transition blocks will be nice to have when putting the final quilt together. Arrange a light and dark square to each side of the center square. Notice that the dark square is on the top on the left but on the bottom on the right. The rectangles will get sewn end to end to form the top and bottom. Again, notice the placement of the dark rectangle differs on the top and the bottom. 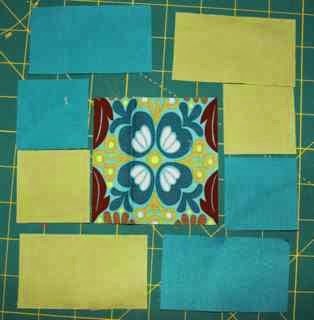 Sew the rectangles together along the short side. Press all four seams toward the dark. Arrange the two patches to the left and right of the center square. Make sure the dark square is pointing up on one side and down on the other. Press the seams toward the center square. Line the long rectangles up along the top and bottom. Make sure the dark fabric touches the dark squares and the light fabric touches the light squares. 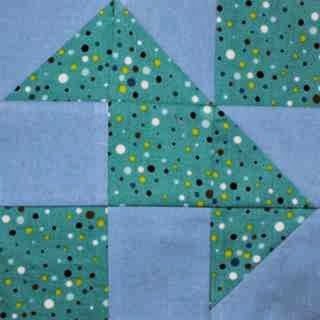 Sew one rectangle to each side of your center unit. Press the long seams toward the center square. TaDa! A quick and easy way to show off a nice print fabric. Impressive fussy cutting, right? 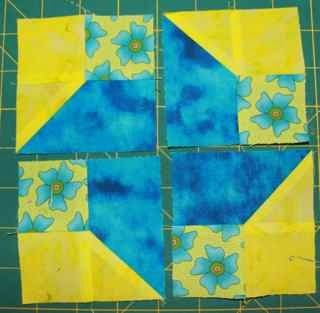 This block idea came from Sophie at Block Lotto, though she used a different method to make hers. Either way would work great, hers has fewer seams, but mine has simpler construction. This one is a nine patch, and so the subunits all come from 2.5 inch strips using the easy angle ruler. It is handy that way. 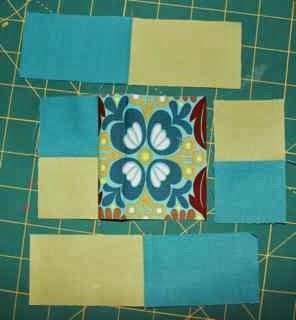 Using the easy angle ruler, take a dark and light teal strip and layer them right sides together. Cut 4 HST units. Now separate the strips and cut three dark squares and two light squares from the 2.5 inch strips. I used a teal as the "dark" and a sky blue for the light. 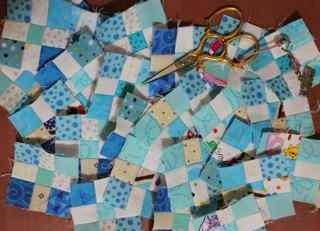 I like the blue sky behind birds, but also think it will help with the transition between blue and teal in the finished quilt. 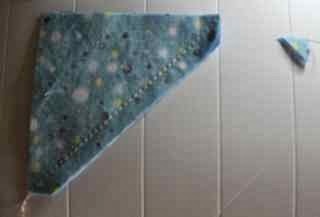 Sew the HST blocks together along the hypotenuse and trim the dog ear. Press half the seams toward the dark and half toward the light. 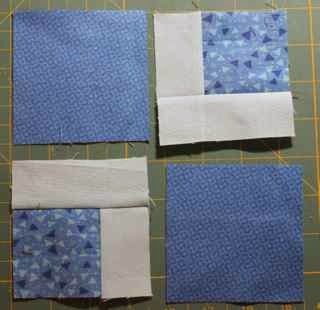 Arrange the HST blocks together with the plain squares as shown. If you are clever, you can get the seams on the HST blocks to nestle by pairing one pressed to the dark with one pressed to the light. I wasn't quite that clever, but I would do better if I were to make this block again. Notice that the dark squares form a diagonal line of head, body and tail while the HST blocks make up the wings. 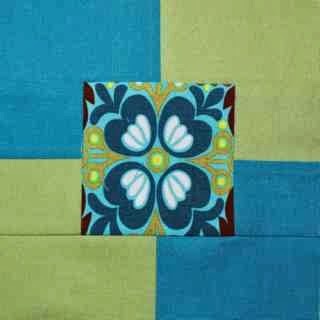 This is my favorite way to sew a nine patch without getting the pieces mixed up. First flip the second column on top of the first and chain sew the three units together without snipping the string that holds them together. Next open the second column up and add the third column to the end of each row. 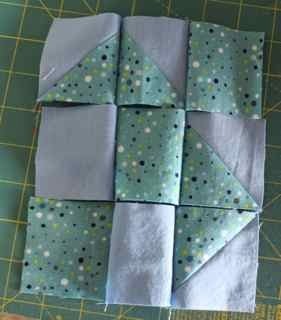 This allows you to check the block placement before getting the rows sewn together. Looks good? Now sew the row together, taking care to alternate the seams. Press and enjoy. A quick and easy, if somewhat geometric bird. As idyllic as vacation can be, coming home again is always nice too. We had such a lovely time in in Jamaica. Somewhere there are a few pictures I will try to dig out, though honestly, we were too busy relaxing to take many. 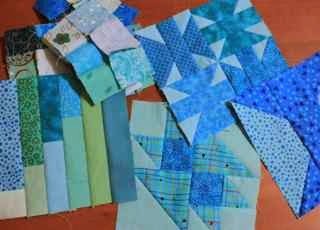 Today though, I dug out my teal scraps and found so many cute fabrics that I want to put into blocks before the purple month starts on Tuesday. So forgive the last minute sprint to the finish, but I'll try to put up a few more samplers before the end of the month. Today is the last scraphappy Saturday in teal. I know some of you have substituted blues and greens to finish out the month and that is great! Whatever you can do to keep using up those scraps is good. Because it is the last Saturday of the month, I will also have the monthly giveaway of beautiful hand dyed fabric from Vicki Welsh. Vicki has been kind enough to send some of her fabric for me to share with the RSC participants. 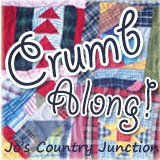 To enter, just leave a comment telling me how many scaphappy blocks, projects or quilts you have finished so far. The prize will be random though, so no need to exaggerate! I'll be announcing the new color soon, so make sure you are getting ready to move on. Just one quick block on my way out the door. Deb at VT quilter showed an adorable cat block this week that I wanted to make, but time has run away with me. This is a super simple block I thought about while walking the dog this morning. I'm still trying to work with lots of variations on simple four and nine patch grids. 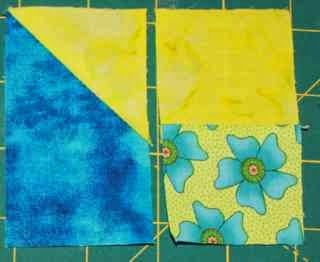 Sew a short rectangle onto each side of a small square. Press toward the rectangle. 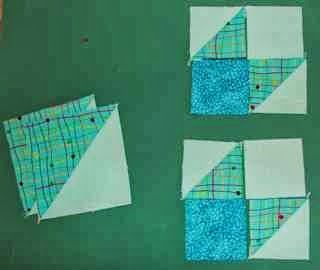 Sew the long rectangle onto the side of each subunit. Arrange these squares into a four patch with the large squares. Tada! Quick and simple modified four patch. Enjoy. I hope you are still enjoying the hazy shades between blue and green. There is still one more Saturday after today to finish off the odds and ends. 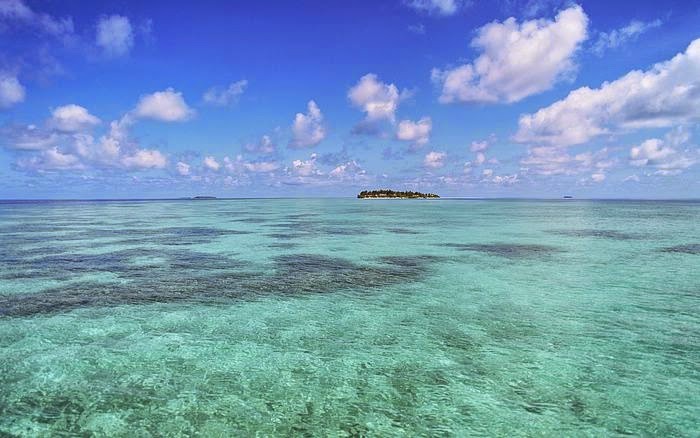 I'll be enjoying my own shades of aquamarine while gazing at tropical water across a white sand beach, so I'll set the next post to go up automatically. Though spring is one day old officially, I know a lot of you are still enduring winter weather. Hopefully that will start to change soon. 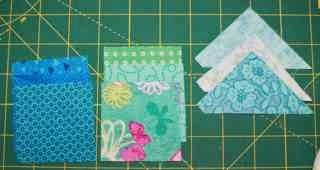 While waiting out the weather, feel free to use the linky below to share your scraphappy projects. I've got just a few pre-company cleaning projects to finish off and then I'l be working on a few more sampler blocks before I go. 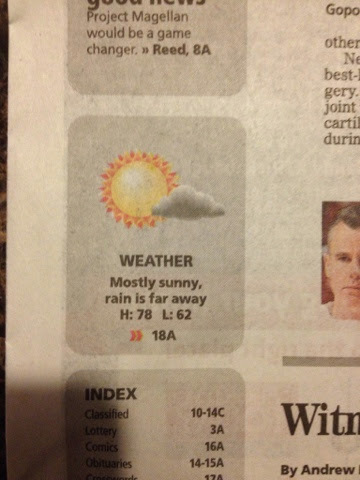 This was our forecast this morning. Not a bad place to live. 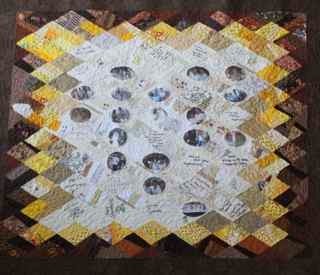 I just pulled the anniversary quilt off of the frame. Now it is time to settle in with a little celebratory binding. This one is done just in time for the in-laws to show up next weekend. It was so nice to have a little time to sew today and even nicer to be able to cross this quilt off the list. DH has been giving me the "evil eye" anytime I sewed on something different wanting to know why his mom's quilt wasn't done yet. Not really, but it did seem that way. Now I will be able to sew without the lingering guilt of knowing I should be doing this one instead. For now though, happy binding! Though there are calm seas in my future, today is anything but. Hoping for time to sew tomorrow as I head out the door for SciOly. 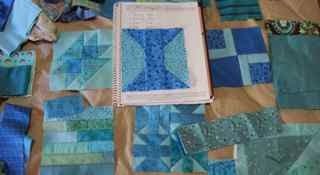 Hoping you are all sewing up lots of scraps in all the colors on a tropical sea. Use misterlinky below to share your progress so far. I took Ryan and Sydney to Firehouse subs for dinner tonight and we decided to celebrate pi day by buying a pie on the way home. Actually baking would have been even more festive, but its been a long week. Kurt is driving Anna to Orlando to set up her science fair board again at the Orlando Science Center. 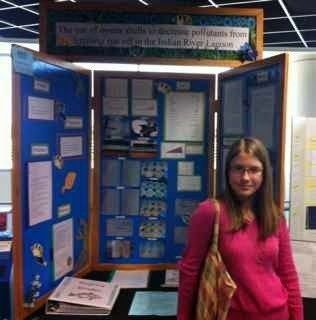 She won the right to compete by doing well at the district level science fair last month. She'll go back and spend the day tomorrow explaining her project to judges and whoever else wants to listen. 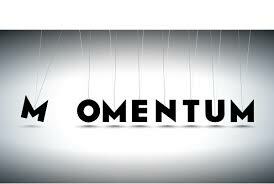 I'l be at the Science Olympiad State competition which is at the University of Central Florida. Sydney has a track meet and Ryan has play practice. Making all of that happen at exactly the same time was a bit of a trick. Hopefully everything will work out just right. 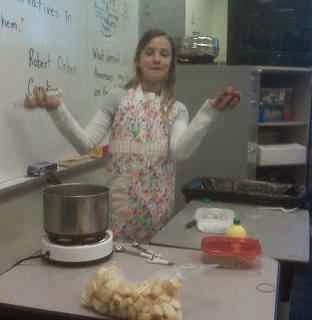 Sydney did a cooking demonstration at school today as part of their unit on food. She made Apple Crumb Sundaes and said they were delicious! 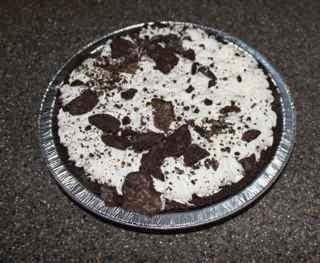 We picked up a movie from Redbox to enjoy with our pie, so I'd better go settle in with the kids. Not much going on for RSC quite yet, but maybe Sunday? This was my view on the way home from work yesterday. 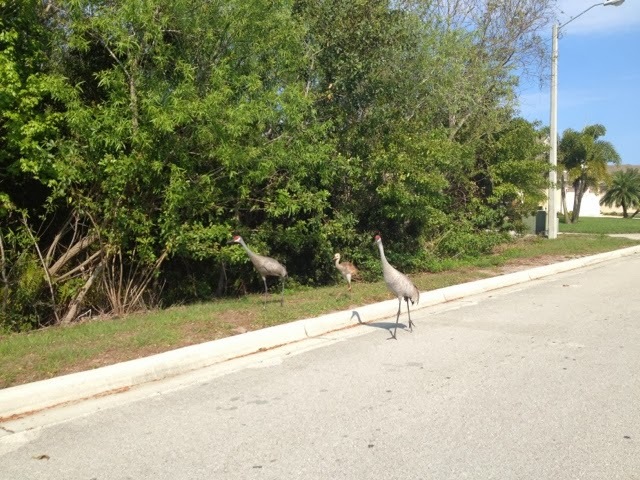 Spring has definitely arrived in Florida when the baby Sandhill cranes start to appear. 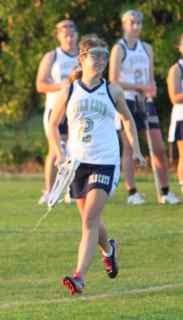 We just got back from Anna's lacrosse game. They won and were up by enough that Anna was able to play near the end of the game. 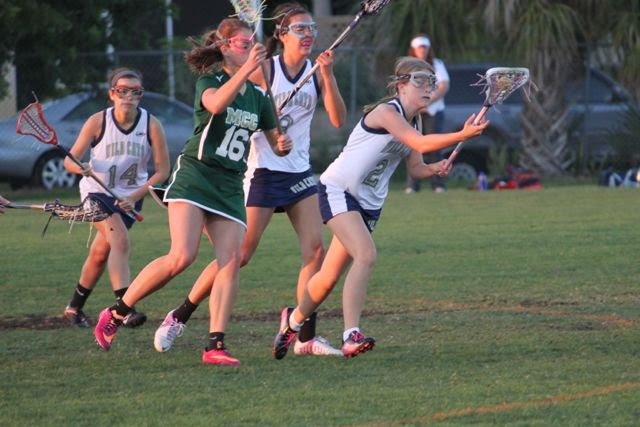 As an 8th grader on a varsity team, she doesn't usually go in until they are ahead by a good bit. It was a beautiful night for a game. Kurt and Ryan worked the concession stand while Sydney and I cheered from the stands. I've been searching through archives of classic blocks and came across this nice simple pattern called Anvil. Just plain squares and two sizes of half square triangles. It doesn't call to me, but it is a nice use of readily available subunits. Last, cut 2 inch squares. You will need 2 in dark teal and two in light teal. 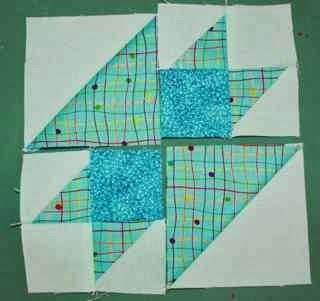 Sew the two large and four small half square triangle blocks together along the hypotenuse. Remove dog ears, and press the seams toward the darker fabric. Set the larger HST blocks aside for the next step. 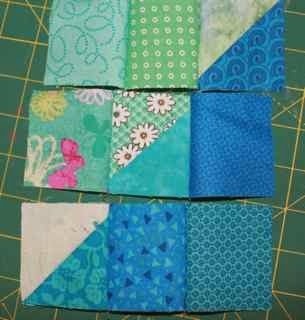 Take the small HST blocks and arrange them into four patches alternating with one light and one dark teal square. 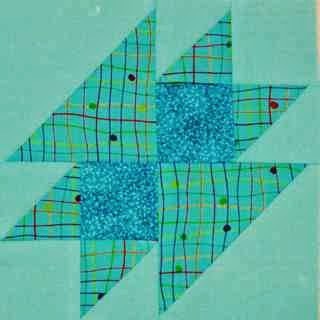 Notice that the medium teal triangles both point toward the center of the block in a bowtie like pattern. 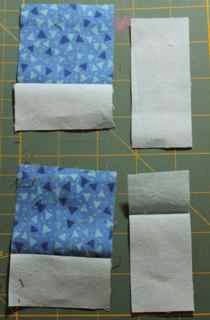 Sew each four patch and press as desired. I like to twirl the center seam, but that part is up to you. Almost there! 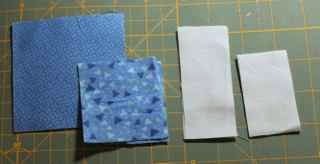 Now take your two four patches and arrange them with the large HST units into a large four patch. Notice that the dark triangles both face the center of the block. TaDa! How cut and quick was that? I was able to whip it up on a school night, that doesn't happen much these days.